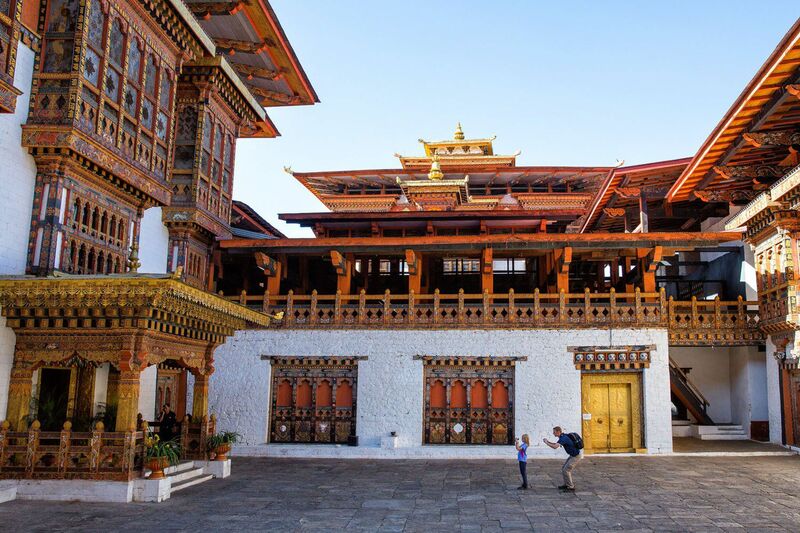 Bhutan, this tiny country located in the Himalaya mountains, has just recently opened its doors to tourism. 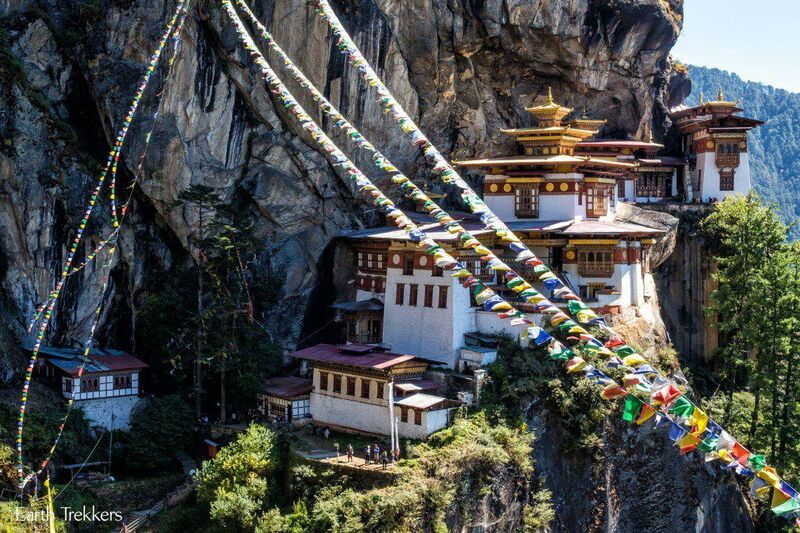 As of 1974 Bhutan began to allow tourists to enter. It wasn’t until more recently when tourism really began to boom here, and tourism has now become a leading source of revenue for this country. 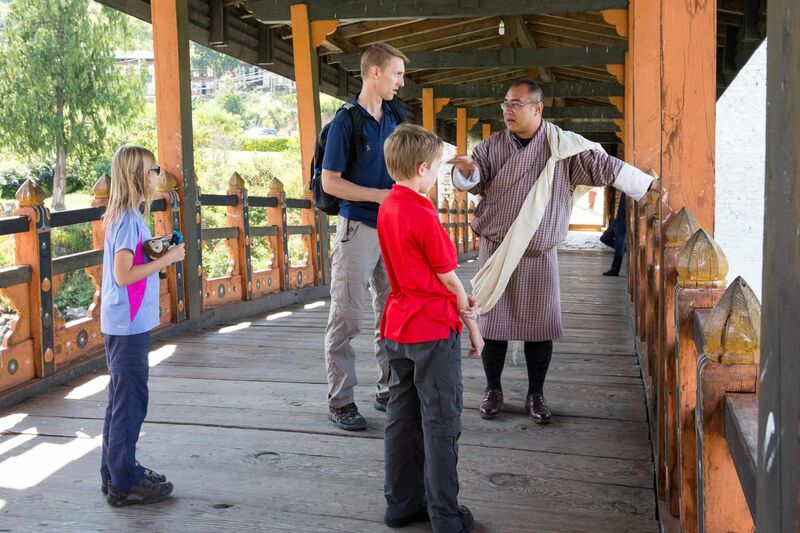 Bhutan believes in offering high-quality tourism. 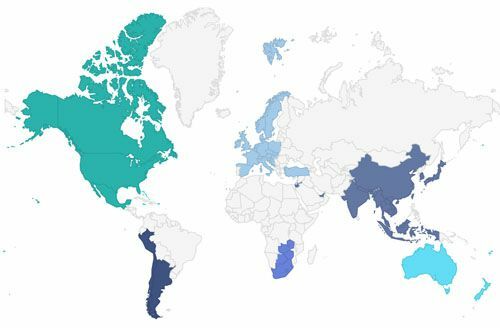 A hefty $250 daily tariff is charged per person to visit this country. 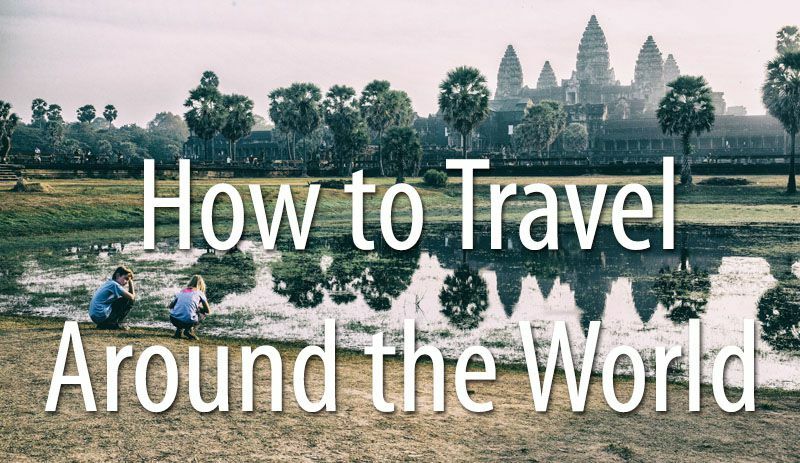 It sounds expensive, and it is on the high side, but it includes accommodations in three star hotels, a tour guide, transportation, all meals, and most activities. 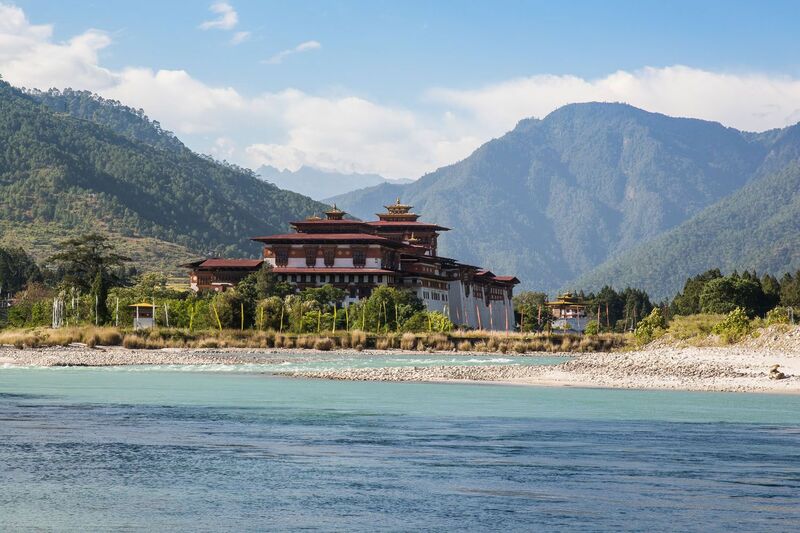 What this fee does not include are flights and other transportation into or out of Bhutan, and anything extra, such as snacks, alcoholic beverages, and certain activities. 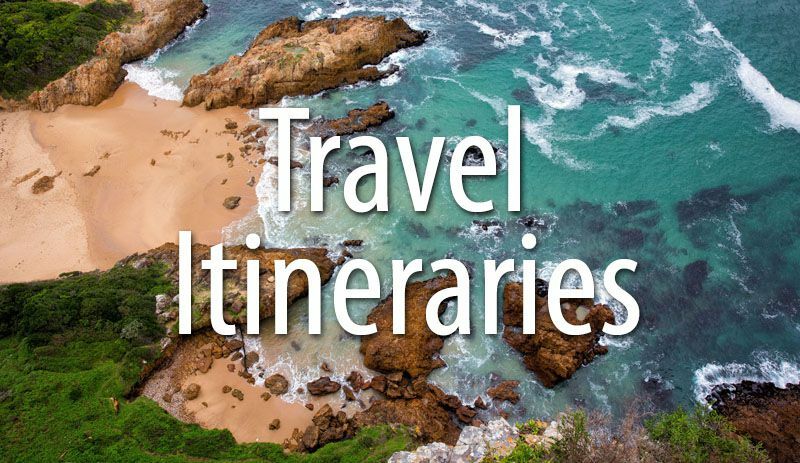 You are able to travel in small groups and make your own itinerary. So, if you multiply the $250 tariff by four (for our family), $1000 is quite an expensive fee. Fortunately for us, children under the age of 12 are half price. Our daily fee of $750 is crushing our daily budget expenditure!!! But I had read that Bhutan is amazing, we were already so close to it, just having been in Nepal, so we scheduled a week in Bhutan, hoping it would live up to our expectations. Our week has just ended and I can tell you that Bhutan is incredible. This has been one of the best weeks of our trip so far…and that is saying a lot! 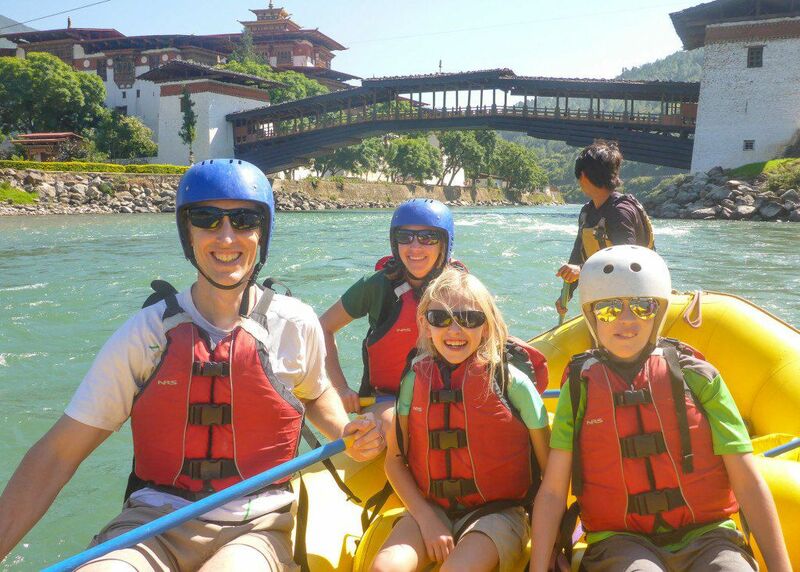 The tour company we used is Bridge to Bhutan (click here to visit their website). 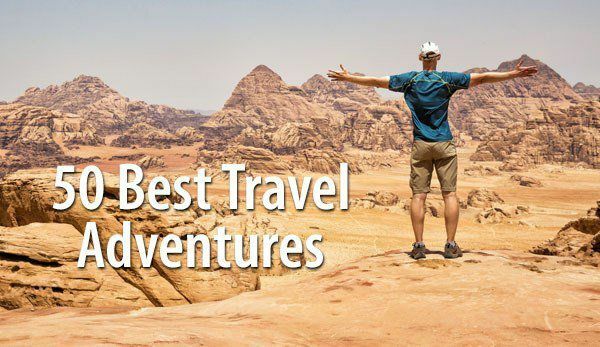 We found them through Lonely Planet and Trip Advisor. Lotay and Fin, the founders of Bridge to Bhutan, helped us plan our itinerary and pick out great hotels during our stay in Bhutan. We felt like they really had our best interests in mind and did everything they could to make our week as enjoyable as possible. 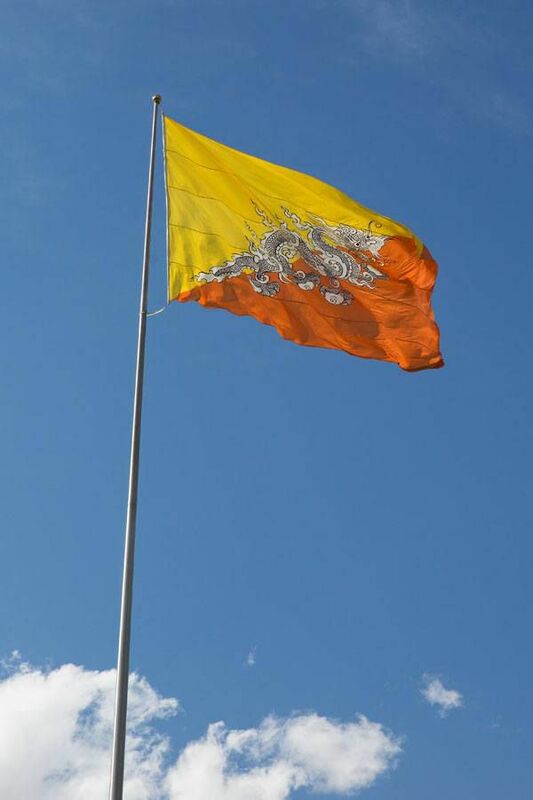 I am hoping we can one day return to Bhutan, and when we do we will not hesitate to use Bridge to Bhutan again. Our experience was amazing. We flew from Kathmandu, Nepal to Paro, Bhutan. 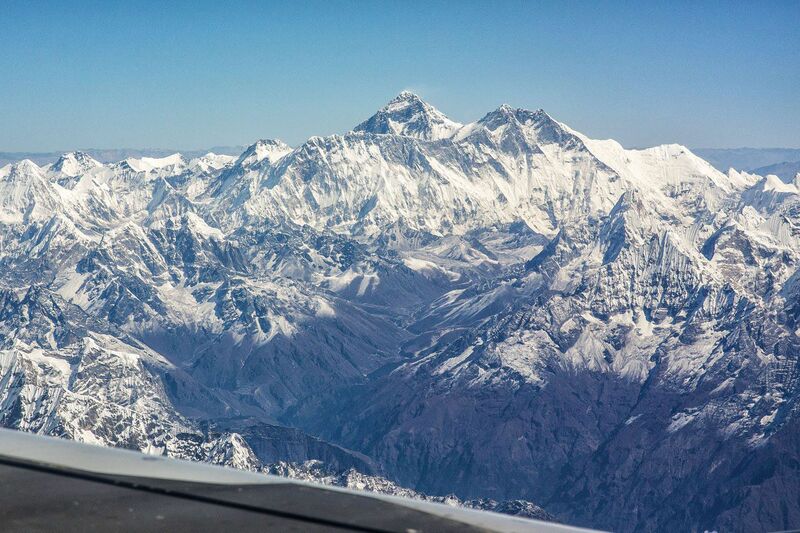 It was a fifty minute flight that took us above the Himalayas (we got to see Mt Everest again!) and we landed in the mountains of Bhutan. Immediately we could tell the difference between Bhutan and Nepal. 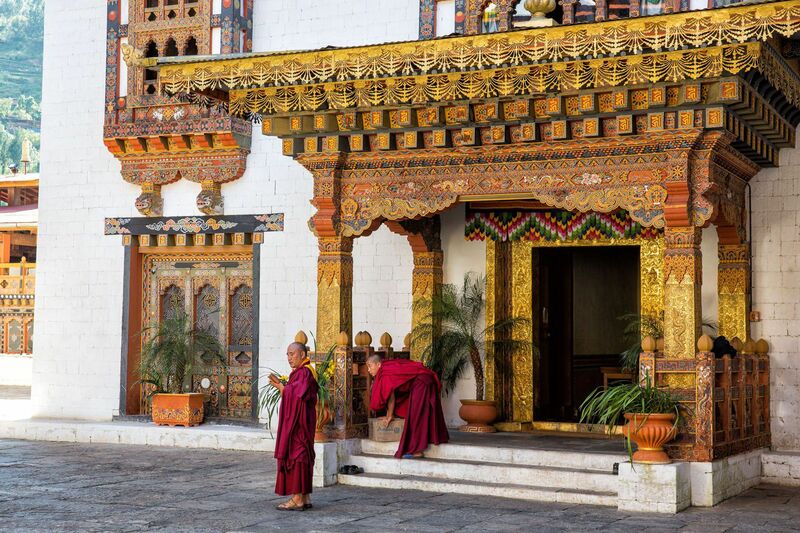 Bhutan is clean, uncrowded, and very peaceful. No more honking horns and crowded city streets, at least not until we get to India. We met our guide, Kinga, and our driver, Sonam. Kinga and Sonam would be our friends and teachers for the week as we saw the best sights of Bhutan. We first toured the capital city of Thimpu. 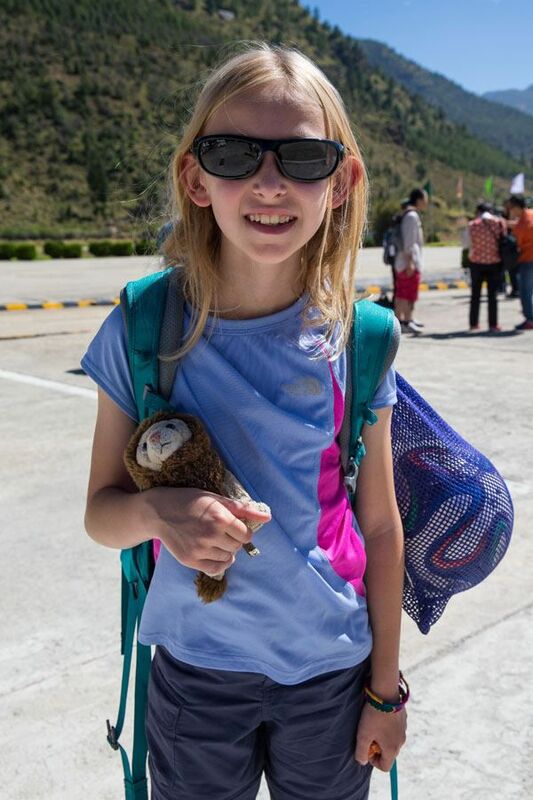 We visited a zoo where we saw the Takin, Bhutan’s national animal, as well as a school where students were learning crafts such as woodworking, painting, weaving, and embroidery. 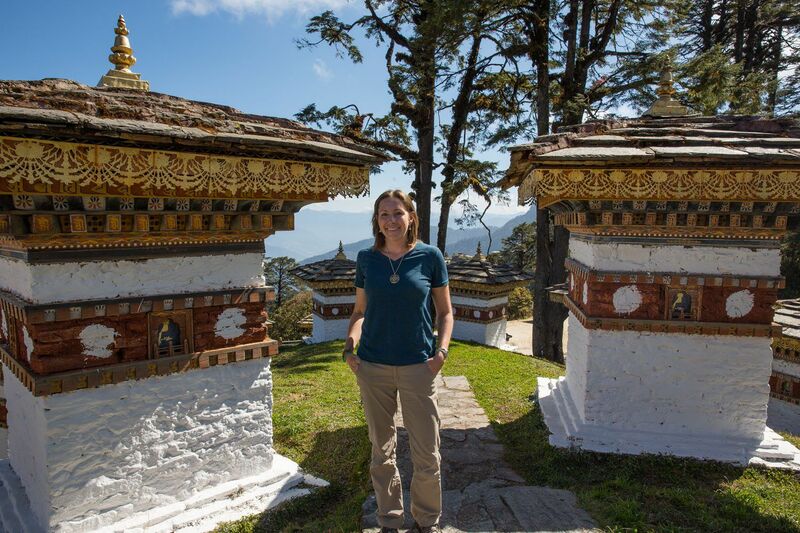 One of the highlights for us was touring the Trashi Chhoe Dzong. A dzong is a fortress with both religious and political purposes. These are large, impressive buildings built over 400 years ago and still in use today. We loved seeing the architecture and the buddhist monks walking through the courtyards. That’s not something you see everyday in the US! Our timing was right to be able to see the famous weekend market. Produce from Bhutan and India were on sale, as well as meat, cheese, and incense by the bag full. We ate a lot of traditional food, more than Tyler or Kara really wanted. 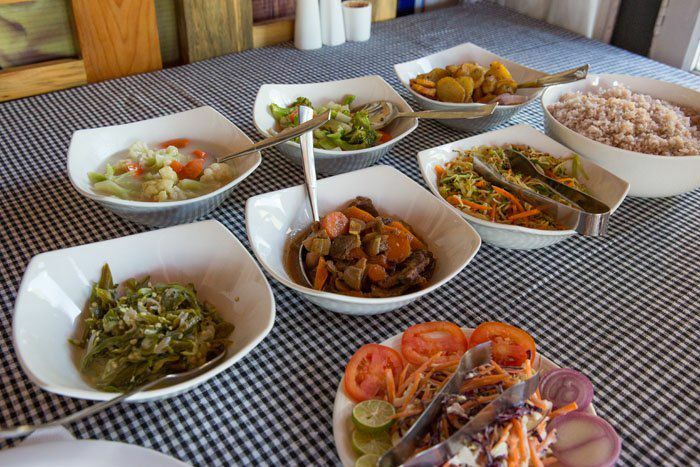 Lunch and dinner would consist of red rice (it really is red), noodles, chicken or beef, cabbage, vegetables, and green chillies cooked with yak cheese. 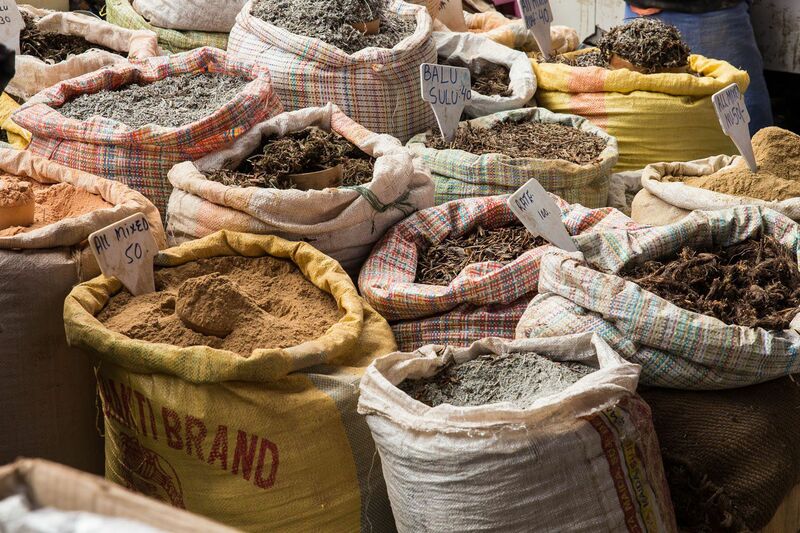 The food here can be spicy, and the people eat chillies here as a dish, not as a seasoning. Also, there are no stoplights here. 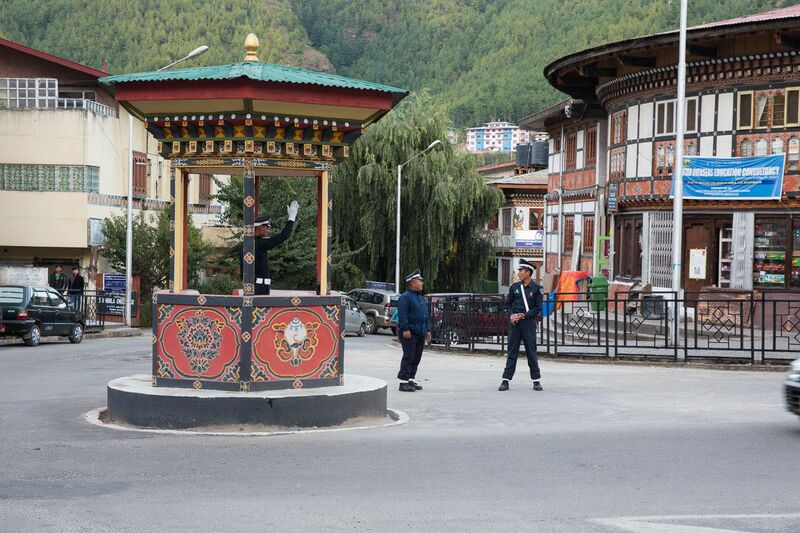 Traffic police direct traffic in more congested areas of Thimpu from a gazebo-type structure like this one. Another highlight of Thimpu was visiting the National Memorial Chorten. Throughout the day many people come here to spin the giant prayer wheels and circumambulate around the chorten. In Buddhism it is believed that the more you spin the prayer wheels the more good karma you accumulate, which is extremely important for a favorable rebirth during the next life. From atop the chorten, this is another view of Thimpu. Another highlight near Thimpu was a visit to the Cheri Monastery (Cheri Goemba). We hiked up 280 meters to a monastery sitting on the mountainside with great views of the surrounding valley. Monks carrying loads of rice on their backs shared the trail with us. Once at the monastery, we all removed our shoes, Kinga took us into the temple and gave us one of many lessons on Buddhism and its famous figures. Before leaving Thimpu we visited Buddha Dordenma, a giant golden Buddha that overlooks the valley below. 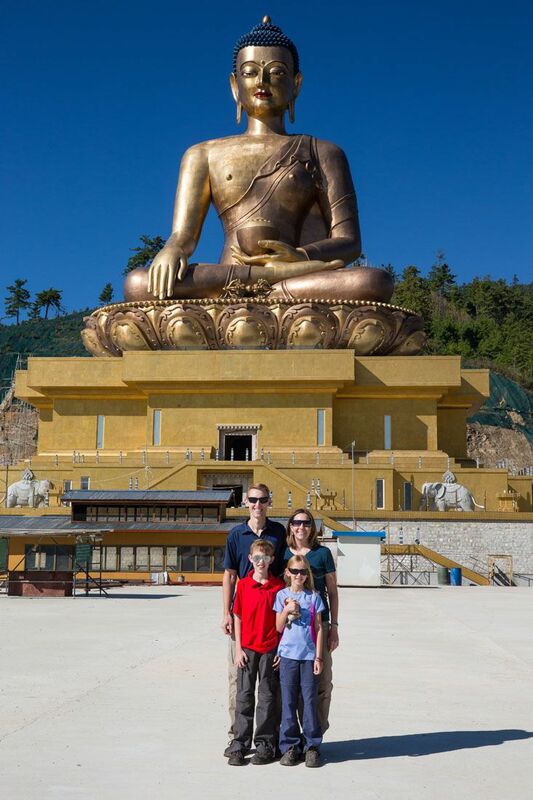 This is the world’s largest sitting Buddha. Once finished in Thimpu, it was time to move on and see more of Bhutan. From Thimpu it was a four hour drive on roads currently under construction. 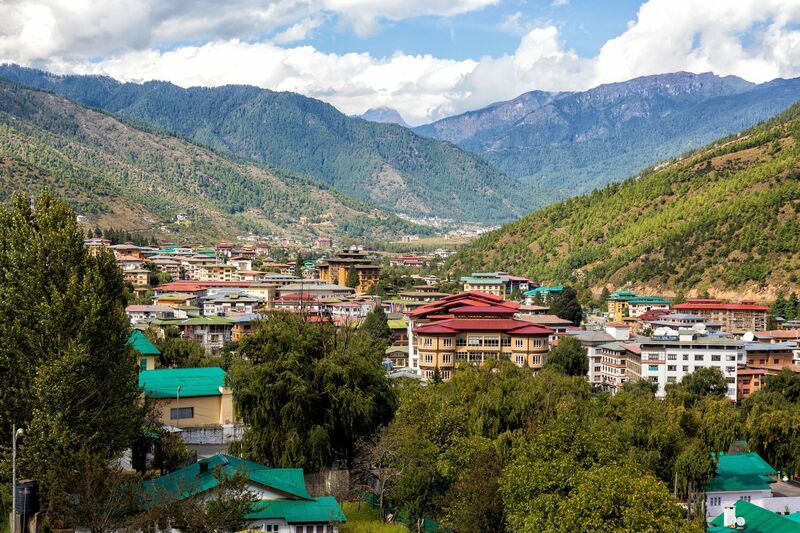 Bhutan is rapidly expanding their infrastructure to handle the influx of tourists. Narrow, winding roads are being widened to be able to handle the increase in car travel. 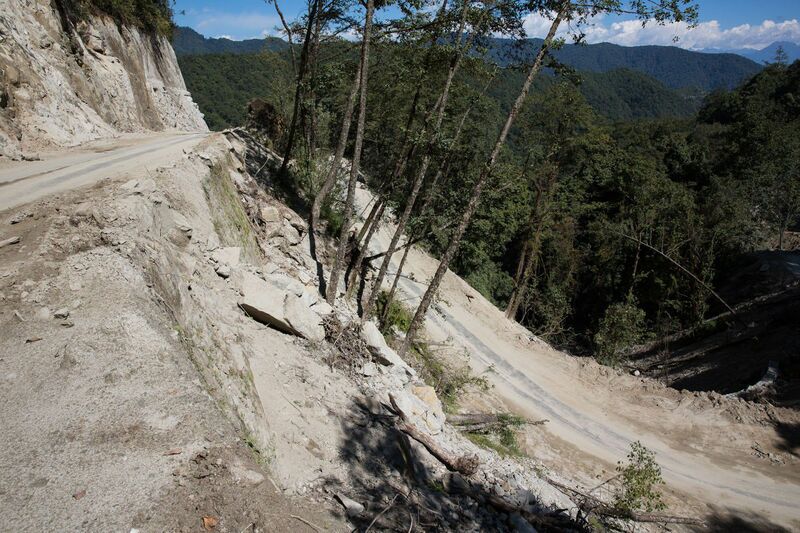 For us, that meant driving on kilometers of torn up, narrow, potholed roads on the side of the mountains. Along the way we passed over the Dochu La Pass (3140 m). From here we had more views of white-capped Himalaya Mountains with Tibet beyond them. Punakha was our next stop, in which we spent two days. We debated adding this time into our itinerary but it was absolutely worth it. 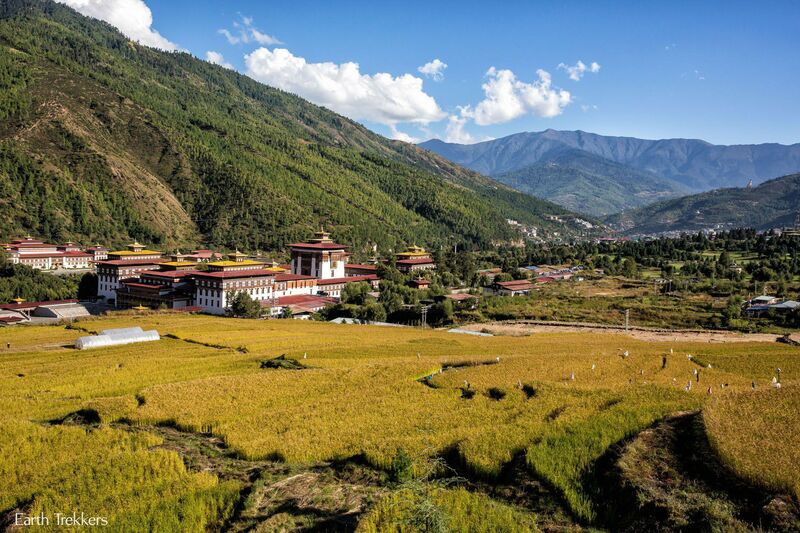 Punakha Valley is a beautiful area, with its rice terraces and backdrop of Himalaya Mountains. 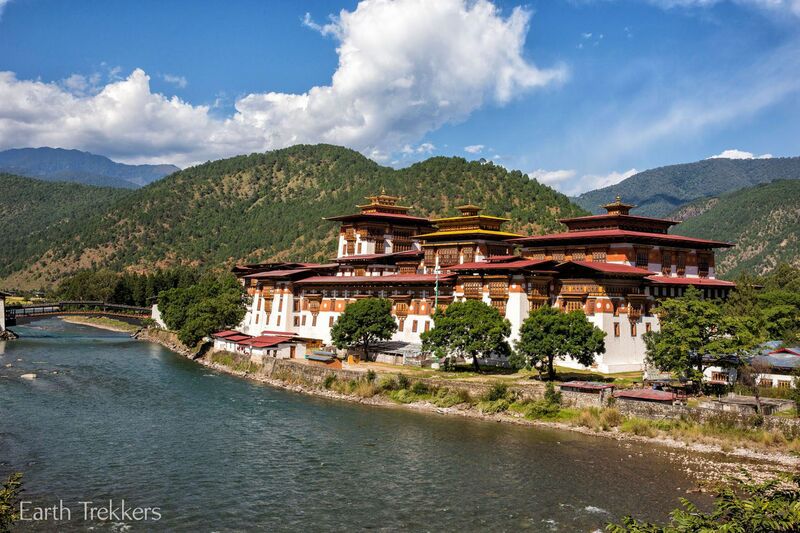 Punakha was the capital of Bhutan for 300 years. This place is rich with buddhist history and monuments. As we drove away we had this view back to the dzong and of the river. What a beautiful place! The highlight for Tyler and Kara was white water rafting on this same river. This was their first time rafting and they absolutely loved it. Lotay and Fin from Bridge to Bhutan added this into our itinerary for us and we are all very thankful. Also in Punakha we climbed up to visit another Buddhist temple, pictured below. The more interesting part was walking through the rice fields. It is harvest time and we watched as people chopped down the rice by hand. 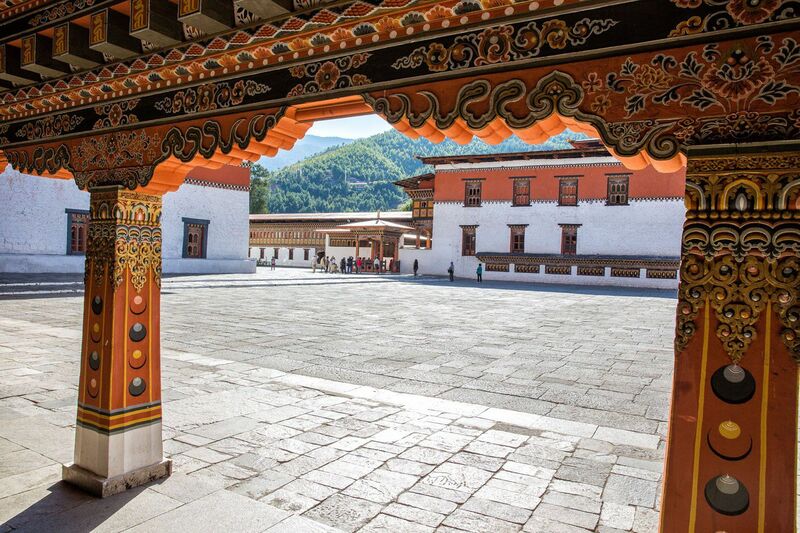 Finally, Punakha is home to Chimi Lhakhang, temple of the Divine Madman. Lama Drukpa Kunley, the Divine Madman, is one of Bhutan’s favorite saints, famous for his sexual exploits. His temple is now visited by childless couples searching to increase their fertility. The buildings around Punakha are adorned with phalluses and these same phalluses are hot souvenirs available for purchase. For a small donation, visitors to the temple are blessed with a wooden phallus and bow and arrow. All four of us were blessed, more to ward away evil spirits than to aid our fertility. What an education Tyler and Kara are getting! While visiting Bhutan, I was fascinated with the woodwork. For the most part, buildings would be rather plain on the outside, with solid color walls, usually white or an earthy color. All of the color and decorations were usually found on the woodwork. We also spun prayer wheels everywhere. 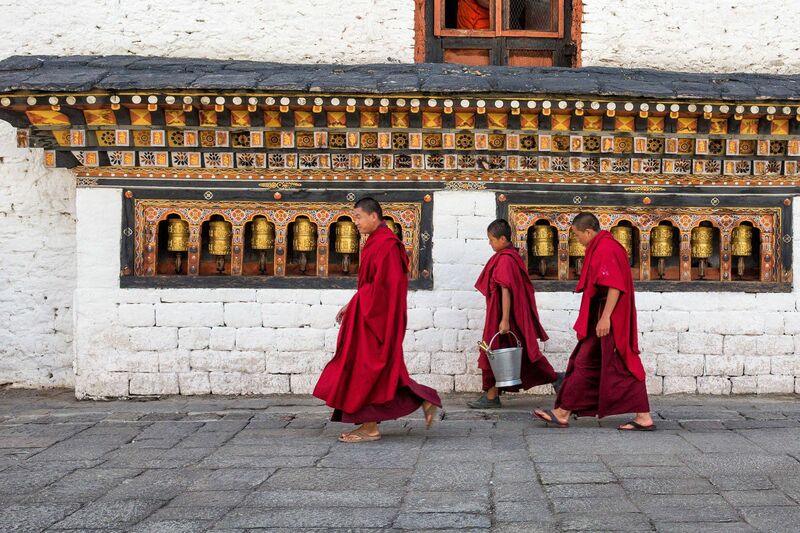 So, what are prayer wheels? Inside of each prayer wheel is a scroll with mantras written on them. Spinning the prayer wheel activates the mantras. 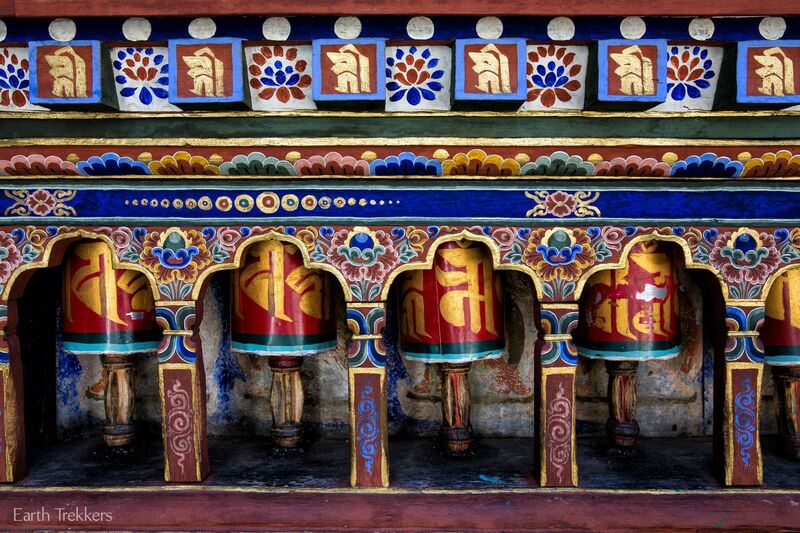 These prayer wheels should only spun in a clockwise direction, usually with your right hand. Spinning these wheels brings good karma, so we spun them every opportunity we could get. Our week ended in Paro. Here we visited the Paro Dzong. I think Tyler and Kara were getting “dzonged out” by this point. But on the way into the temple we met these young Buddhist monks who sold us bracelets to ward away evil spirits and disease. 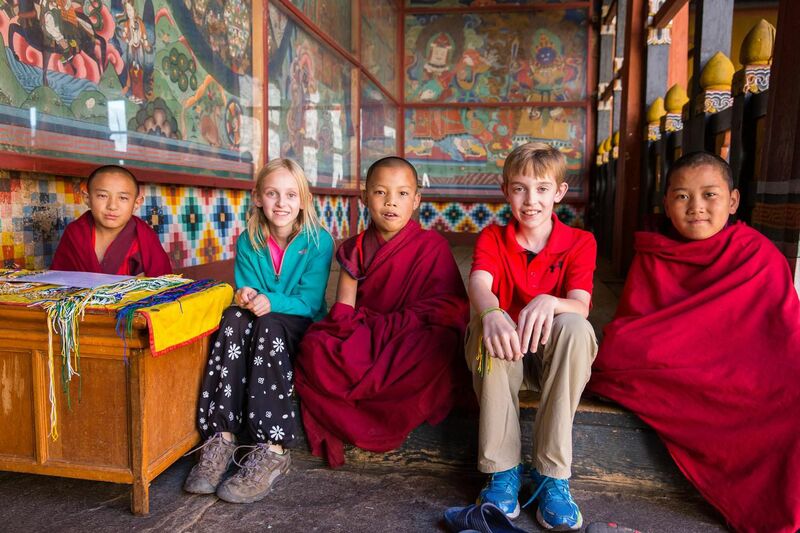 They agreed to have their photo taken with Tyler and Kara, one of my favorites of Bhutan. On the walls of the temples would be paintings of Buddhas and various scenes from the history of Buddhism and Bhutan. Photos are not allowed inside of the temples, unfortunately. 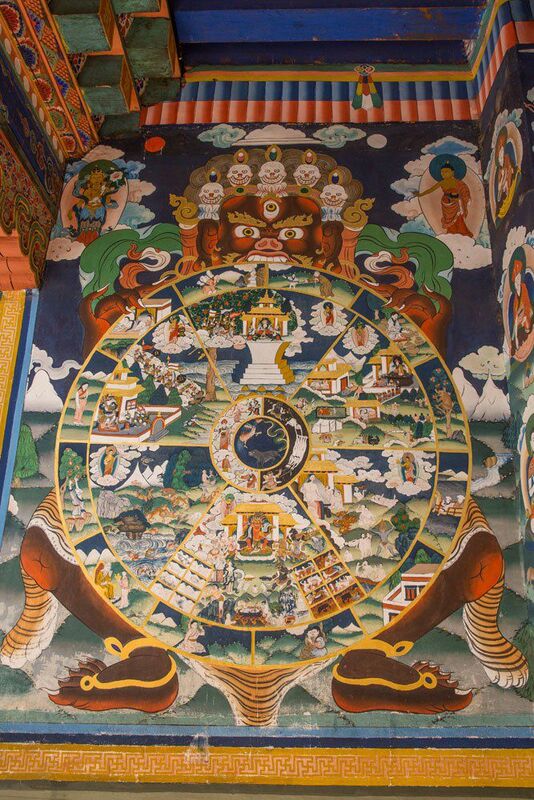 But outside I took a photo of the Wheel of Life, a painting depicting the Buddhist interpretation of the human life cycle. 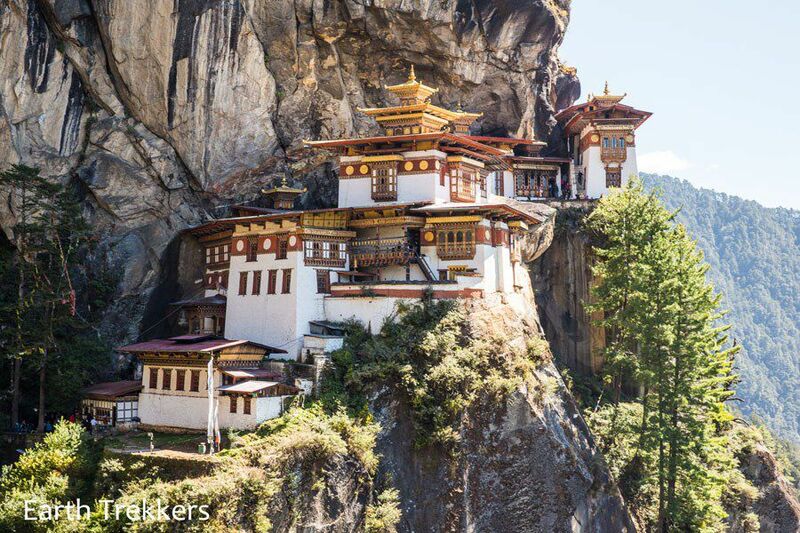 Our grand finale in Bhutan ended with a hike up the the Tiger’s Nest Monastery. 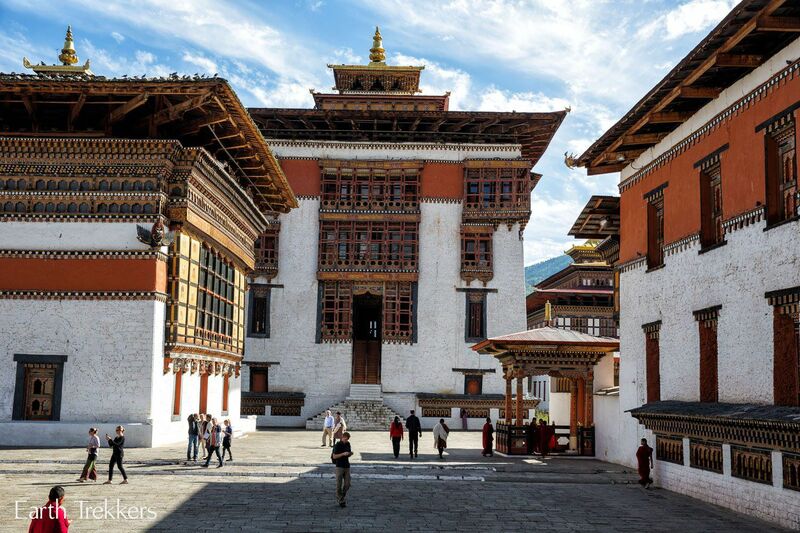 This monastery is the most famous sight in Bhutan and a trip here would not be complete without a visit to this monastery. 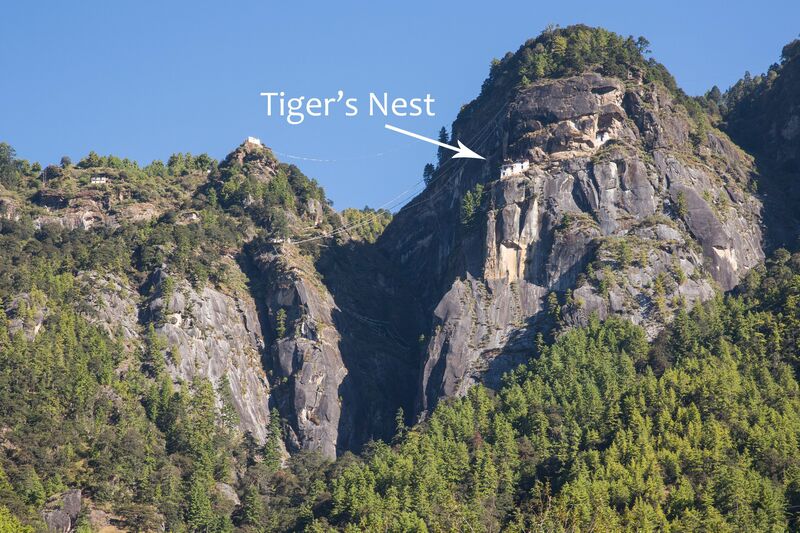 The Tiger’s Nest is perched on a rocky cliff high up off the valley floor. It can only be reached by hiking, so we were all for it. We hiked up the mountainside with Kinga and Sonam for two hours, stopping for a quick break along the way. Our reward was an amazing view of the monastery. This place is truly spectacular. Kinga took us through the Tiger’s Nest, visiting some of its temples and enjoying the view down to the valley below. This is one of the coolest places we have been yet. Is Bhutan Worth Visiting? Yes! We all loved Bhutan. It was worth paying the daily tariff in order to visit this amazing place. At times we felt like we had gone back in time, especially when visiting the dzongs and watching workers in the rice fields. So, if anyone is wondering if traveling to Bhutan is worth the expense (like we were nine months ago), it absolutely is. It is also worth adding the time and going out to Punakha, as this was our favorite part of visiting Bhutan. Now we are off to India, a country we are looking forward to and honestly very nervous about. Most people who hear that we are traveling to India tell us that we are very brave. Is five weeks too long? We will find out soon. How did you pay things there such as food and things we can buy? Do they accept money or we need to trade something? Yes , as mentioned by Julie most of the tour arrangement including accommodation, food, vechile, guide, entrance fees, government royalty and taxes etc. are included in the government prescribed rate. For misc expenses you can easily change money at a local bank or at an ATM at airport or market. 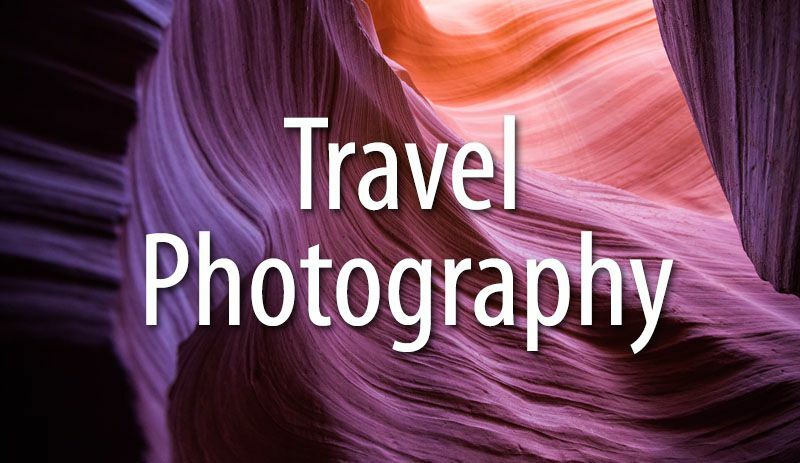 Your photos look amazing. 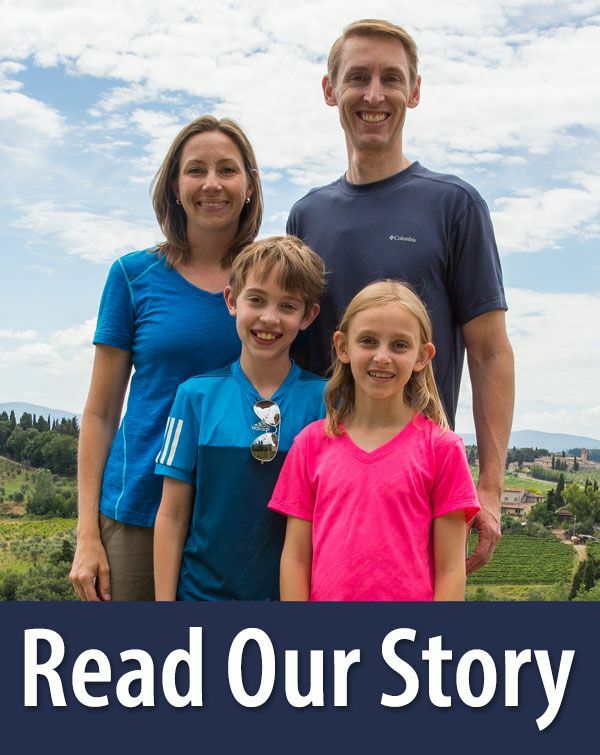 Did you and your family go to Bhutan in October? 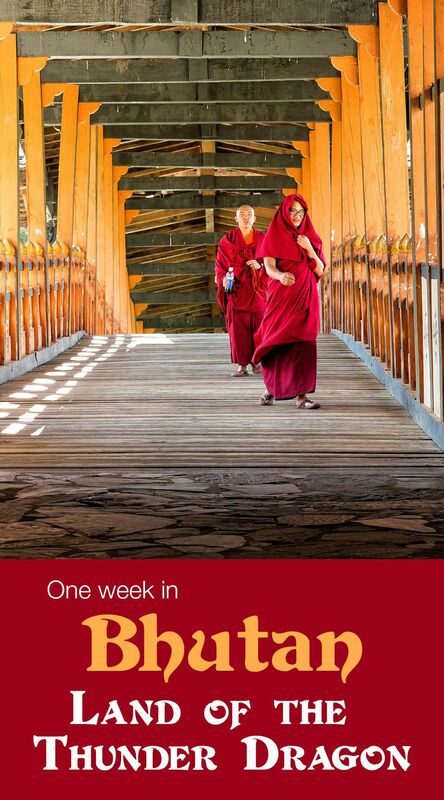 Yes, Bhutan is amazing. We loved it there and hope to return again someday. 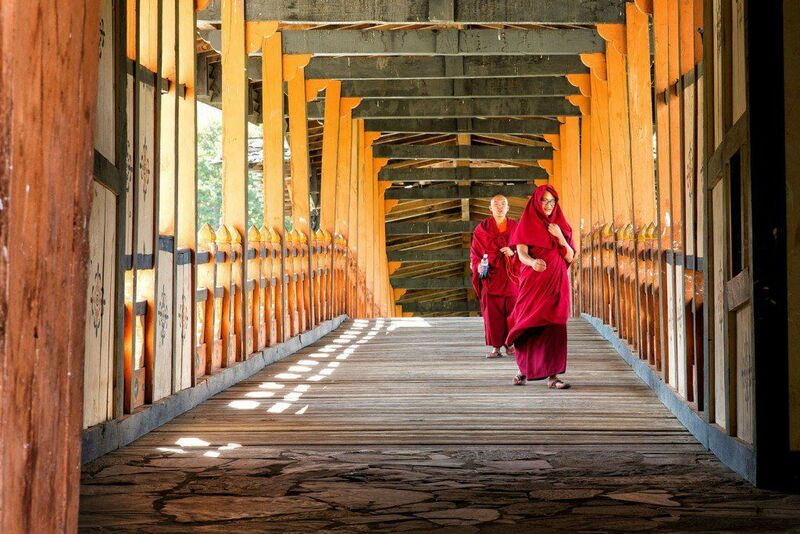 Wow.. great photographs on Bhutan. 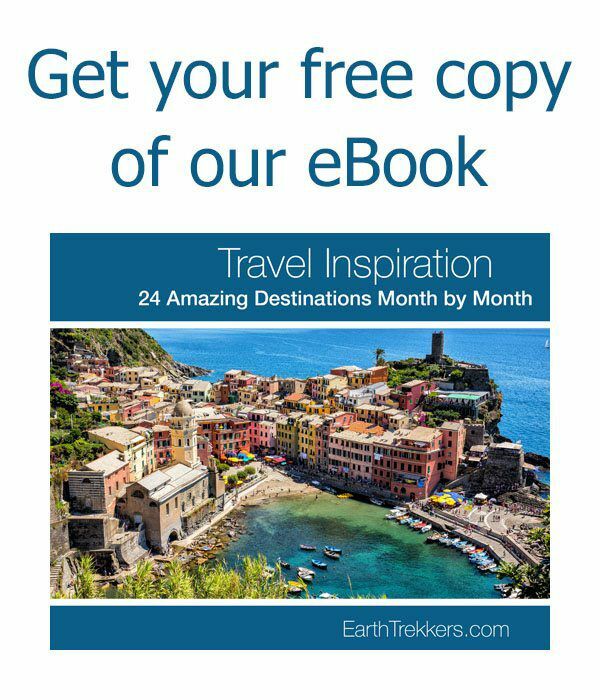 Can i share some of your article on Bhutan on my website? They’re really lovely. Also do send me your email address for my reference. This makes me very jealous haha…You look like you had so much fun!! Someday I hope to visit…once I get money. Cool!!!! Thanks for taking us to this far away place. You all look great and fully recovered from the Everest Experience. Now I know so much about Bhutan. I can’t imagine how the Tiger Nest was even built way up there.